When finding a native animal in distress it will be in shock and extremely stressed. Native animals do not show stress like domestic pets, they will be silent and try to hide their injuries, because in the wild an injured animal is easy prey. If it is in your yard, lock up any domestic pets, even if you feel your pet may not be a risk to the animal, just being there is enough to stress the native animal, and stress can kill. Native animals are not used to being handled by humans. Improper handling can cause injury. The animal will struggle, and may hurt itself more. Please do not be tempted to care for native animals yourself. Unfortunately it inevitably ends in disaster, as native animals need specialist care and specialised food. All Wires carers are trained to care for these animals. If you are interested in native animals consider becoming involved with Wires. Remember: It is against the law to keep native animals taken from the wild. They must be passed onto a licensed carer, National Parks or wildlife rescue organisation. It can be exciting for children having a native animal, and very tempting to want to look and explore. PLEASE do not allow children access to the injured animal. It is already in shock and considers us as a large predator, so any undue handling is only going to stress it more and stress is a killer for native animals. Place a towel or similar over the animal, put in a box in a dark, warm quiet room and DO NOT DISTURB. 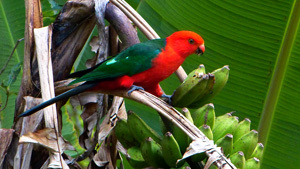 Fire Season is not a good time of the year for many of Australias' native Wildlife. Hazard reduction burns and people burning off also contributes to the number of animals WIRES sees coming into care dure to burns & habitat loss. Many of our Aussie animals have adapted with fire, but for some it has not been so easy. We all think that wildlife can run or fly away from a fire. But this is not always easy, as was the case for a young Echidna that came into WIRES care recently. So How Do You Burn Off Safely? We have found that the safest way to burn off is to start a small fire next to your burn pile and feed the logs, sticks etc onto the smaller fire. Alternatively start burning from one side of your burn pile only. This will leave an escape route for most wildlife. Probably the best solution, these days, is to compost rather than burn off. Better for the planet and all our wildlife who make these piles their home. But most importantly check your burn pile before you light it. Please do not feed, or give water to an injured adult bird. Place it gently in a box with some soft material like a towel in the bottom, so the bird will not slide or hurt itself when transported. Please cover the box, remember the bird will be in shock, so any noise or disturbance will further shock the animal. Keep it away from domestic pets. Many birds are territorial, so make sure you take note of the exact spot you found the bird, as it will have to be returned to that location.. Phone Wires as soon as possible, and they will let you know what to do next. Juvenile birds are often left unattended for short periods of time while the parent birds may be foraging for food. If you see a young bird alone, observe for a little while and make sure there is no parent about, also look for a nest near by. The bird may have fallen out, in which case you may be able to put it back in the nest. Birds WILL accept their young back after being handled by humans. Featherless birds will need heat. Place a WARM water bottle in a box, cover the water bottle with towels, and place the young bird in something resembling a nest such as an ice cream container or small basket. Cover the box, keep in a quiet dark place and call Wires as soon as possible. Please DO NOT give the bird anything to eat or drink. If you find an injured adult possum, please pick it up carefully in a towel or similar, and place it in a box in a quiet dark place. Make note of the exact spot, as possums are territorial and will have to be returned to that location. Pease DO NOT give the animal anything to eat or drink, it is in shock no matter what may have happened to it. Please call Wires or your nearest wildlife care organisation as soon as possible. A young possum joey will require a pouch, this can be made from a pillow case, or jumper, as long as the possum feels secure and can not look out, it will feel less stressed by the situation. An un-furred possum joey will need heat. This can be achieved with a warm water bottle wrapped in a towel. Put the joey in the pillow case near the water bottle. Check the temperature to make sure you are not cooking the joey. Some possums like Ringtails usually have more than one young, so please check pouch and surrounding area. Young possums travel on mum's back, so there may be a young hiding close by. It will not be able to fend for itself and will need to come into care. Kangaroos, Wallabies, Bandicoots, Possums and Gliders all have pouches, even Echidnas will develop a "pouch" in which they carry the egg and later on the tiny echidna 'puggle', until such time that it develops its quills. Injured or orphaned young pouch animals must be placed as soon as possible in something resembling a pouch, it is important that they feel secure. If the animal is unfurred it must also be kept warm, not hot, but similar to your own body temperature. A warm water bottle can be placed in a box, cover with one or more towels.Place the pillowcase or whatever you use to make the artificial pouch on top of the towel. Check the temperature regularly to ensure the animal is not being overheated. Please DO NOT give the animal anything to eat or drink. Native animals can not tolerate cows milk or soy milk, they need special formula. Damage can be done by feeding them unsuitable food. Call Wires 02 66281898 or your nearest wildlife care organisation as soon as possible for advice. 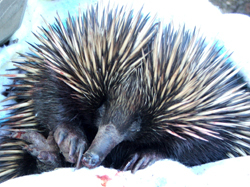 Echidnas injured by cars MUST be taken to a veterinary clinic and X-rayed. It is impossible to examine these animals properly without X-ray as you can not feel broken bones as in other animals due to the spines. They may look just fine andmove normally, as they will not show their injury. An injured animal knows it is in big trouble, and as such will hide their pain, trying to fool predators. Echidnas can not tolerate temperatures above 30 degrees. Please ensure if transporting an Echidna that the temperature is below 30 degrees. Best to transport in the cool of the morning or evening on hot days and or add an ice pack to the container. If you should find a puggle, please ensure it is kept cool until help has arrived, an ice brick in weather like we are currently experiencing must be close by the puggle in order to keep it cool. You can place the puggle in a jumper and an ice brick close by, do not put the puggle directly on the ice brick. Temperatures above 30 degrees are fatal for this species. Snake found in your house. First thing to do is keep all pets away and make sure children are not close by. The snake may have entered your premises looking for shelter or food. Observe the snake and open doors and windows so the snake can leave. Close all exits to other parts of the house, and observe from a safe distance, giving the snake time to leave. If you need help, take notice of the snake's size, colour and head shape so you can give the rescuer a description. Do not aggravate the snake, as it will become hostile and defensive, making the capture more difficult. A snake in your garden may just be passing through. If you leave it alone, it will most likely move away when it is ready. Snakes will come looking for water at dripping taps, or pet water bowls, specially in dry weather. Make sure pets do not disturb the snake, as it will become defensive.Keep children away and let the snake go on its way. It may take a bit of time as it will wait until it feels safe. Most people who are bitten by snakes are bitten when trying to capture or harm the animal. Snakes are not aggressive creatures, they will merely try to defend themselves. If you find a Flying Fox or bat of any sort do not handle or attempt to rescue. Please call WIRES immediately because although Australian Bat Lyssavirus is very rare it can be transmitted by a bite or scratch from an infected bat, including a flying fox. If a person is bitten or scratched they should wash the wound with soap and water for fve minutes and seek medical advice immediately. For more information on Flying Foxes click here.